Snake eyes! No autocannon hit for you…! My review of the latest iteration of the Car Wars franchise was billed as being EPICALLY COMPREHENSIVE over on the Castalia House Twitter feed, but it was lacking something absolutely critical: an account of what it’s like to play the game just with what’s included in the new box set. Hopefully this post will rectify this glaring omission, though admittedly there are about half a dozen different use cases that deserve to be tested here. This is just one way to play and is not necessarily representative… still, if you’re new to the game, this will hopefully give you an idea of the sort of thing you can get into with it. In this case, I put my son into the driver’s seat of any car from the stock vehicle list included in the rule book. He chose a Mauler and agreed to take a hi-res targeting computer as an option. (Note: the hi-res single weapon computer is omitted from this edition’s equipment list, so this was the full on $4,000 model!) He expressly turned down the option to take turreted model with the laser. I set him up in the unnamed arena included with this edition. (Nitpick warning: The lack of background information and Autoduel America local color is kind of disappointing and not at all consistent with the many other arenas that were previously published. Hey, I actually care what state this takes place in as it impacts the roleplaying options!) 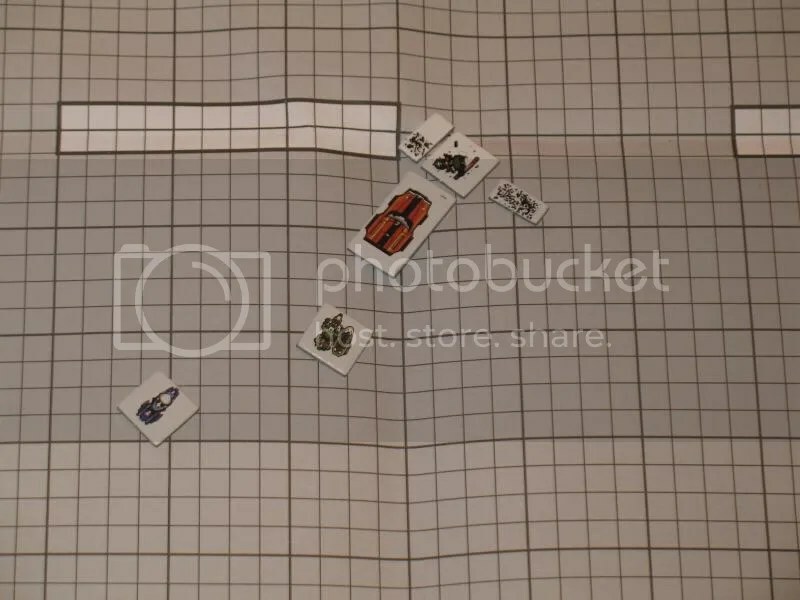 I don’t tend to care for one-on-one duels as much in Car Wars (Star Fleet Battles is better for that sort of thing in my opinion), so I put my son at a randomly selected starting gate and placed a stock Shogun 200 motorcycle at each of the others. This is a border-lined “monster” battle and not really intended to be a quick one, but by eliminating hand weapons from the mix, I’d hoped to finish well before my son’s attention span expired. I don’t think this is an ideal way to run the game. Here you can see the initial action. My son had scored two consecutive hits on a his first target, sending its wreck careening into one of the barriers. The other cycles were not in position to concentrate their fire and two couldn’t really even get into play at all at first. These opening moments were positively demoralizing for me and I didn’t see any what that I could possibly even the score. The intricate ballet of destruction came to an end when my son came to a stop after a ram. Normally this would have just slowed him down a little, but he was eager to train his autocannon on the annoying motorcyclists. He blurped my green cycle with his flaming oil jet and my green cyclist panicked and backed off. This split my cyclists’ fire between two different sides; not very effective! By then though, my pink cycle had managed to finally get around the wall that was keeping him out of the fray. My son whipped his car around and fired at the blue cycle several times, but bad die rolls meant my son’s luck had finally turned against him. I think he missed two shots in a row when he really needed to be eliminating another cycle right then. Thanks to the ram damage he had sustained along with a great many rounds of machine-gun fire, my son was suddenly in serious trouble. His front armor was finally gone and his autocannon was taken out shortly thereafter. (Eh, it was out of ammo then anyway, but I didn’t tell my son that. Didn’t want to poop his party there.) This twelve seconds (game time) of autodueling had taken about two hours to play out. And note here that while my son readily grasps the idea of winning with superior vehicle designs, he does not really grasp the concept of winning through superior driving. This is not uncommon with novices. You can beat people like that by outplaying them and they will still blame the hardware after a session. Granted, we were still kicking rust off this time and getting the hang of things, so this was not exactly a fair test. Nevertheless… this is something to watch out for in new players. They’ll have a blast souping up their cars and blowing people up… but it’s really hard for them to gain an appreciation of the tactical side of the game. Alonzo Iglesias was driving the pink cycle. He earns one point in each of Cyclist and Gunner for entering combat. He earns another point in each of Cyclist and Gunner for scoring the final hit that triggered the Mauler’s surrender. He earns five general skill points, which he saves back so that he can purchase a new skill later on. He has five Prestige points… less than the guy he beat! (Oops!) Finally, he has a fully functional Shogun 200 (6 MG shots fired and 6 points of damage front) and working Mauler (AC destroyed, 2 points of damage to power plant, no front armor, 22 points of damage left, 32 points of damage back.) He can sell the hi-res computer to repair either or both! This character is adventure-ready! He can go back into the arena for another amateur night game if he wants to take his chances there… or he can maybe take on a courier job and risk running into a cycle gang on the road. Siddhartha Desai was driving the green cycle. He earns one point in each of Cyclist and Gunner for entering combat. He earns one general skill point which he saves back so he can purchase a brand new skill later on. He has one prestige point. He has a stock Shogun 200 with 9 shots left in its machine-gun. Its tires are scorched with flaming oil: the front one has three points of damage and the back one has two points of damage. (I’m trying to think how he might have snatched victory from Alonzo; probably not unless he had been almost suicidal. If he’d been played by another player, he might have tried. Still, being alive and having even modest wheels is no mean feat in this game.) This guy has to choose between entering another amateur night event and maybe joining the gang that goes after Alonzo! I didn’t declare anything before the event, so we’ll assume the arena’s paramedic just has the skill at base level. (This is not the most popular place around.) Yellow was shot with autocannon fire and then skidded into a wall at forty miles an hour or so. That sounds like a -3 penalty to me. White was rammed at a combined speed of 90 miles per hour. Gosh, that’s got to be a good -4 penalty. Finally, Blue was shot with autocannon fire and then burned up in a fire that was started with the power plant. That’s gotta be the worst, coming in at a -5 penalty. So the rolls required here to get “revived” are 10+, 11+, and 12+ on 2d6. (Yeah, I’m winging all this. People will care about this when it’s their continuing character on the line later… so I might as well think through it now.) None of these guys make it. Cycles are dangerous! Death is good for ratings, though. Maybe the arena will be able to hire a better paramedic before long…. The first few turns of the game drag a little. Executing movement phase by phase for all six vehicles is somewhat tedious and it seems that it takes a while before things really get into gear. This particular scenario does not begin “in media res”, but consequences are soon dealt out based on how the clock gets collectively wound up by the players. Again, the game does not start with a bang: the jockeying for position of the opening is subtle and not particularly dramatic. The game’s potential to descend into chaos at a moments notice is what makes it attractive, though. The opening moves are definitely the calm before the storm. The end game of this particular session was something of a grind. It really dissolved into a die rolling contest. I don’t think this was a function of either the game or the rules, but rather was a consequence of my son failing to grasp the necessity of driving offensively. If the players collectively decide to just stop and pivot, this is what you get. But the player that has mastered the art of maneuver will usually have a significant advantage over someone that’s willing to resort to this, however. Also, certain pieces of equipment can provide some additional punishment for the slow pokes. The middle portion of the session… wow did it work. The action was intense. Every phase seemed to matter. The rules held up. It was engrossing, rich, and immersive. My son was really into it, too. One thing that was reiterated to me here was how you tend to have a feeling of control when you are at range. But when vehicles get close for a pass… things get really volatile. It’s like a gravity well that you won’t necessarily be able to pull out of. You have to respect that if you want to master this game. This particular arena has so many barriers in it, you have even less of an option for keeping your distance than usual. 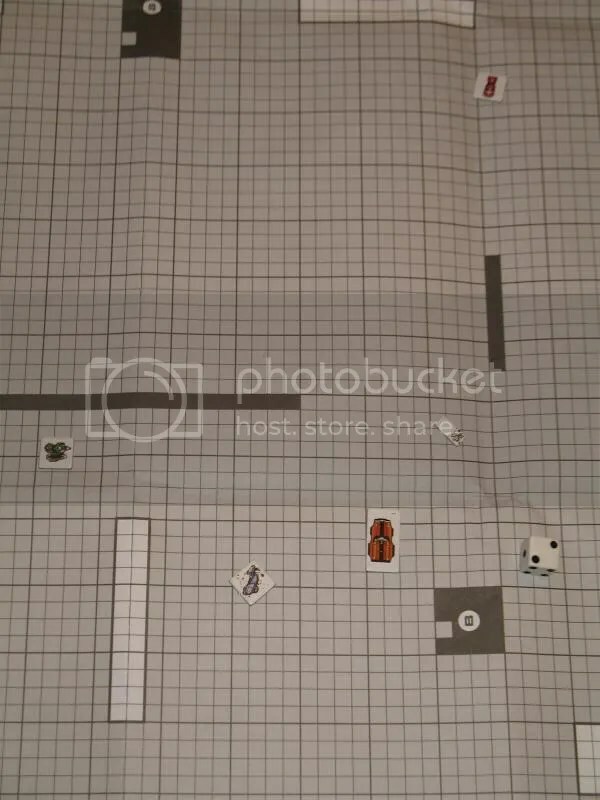 The speed modifiers rules are solid. These are something that I have tinkered with in the past, but taking another look at these here I am completely satisfied with the “official” rules. They did not slow down play, they were easy to adjudicate, and encourage people to go fast, and they don’t mess up the game. Admittedly, I did suggest that my son take a hi-res computer specifically because I anticipated that the speed mods needed to be offset somewhat for the game to be fun for him. (Psychologically, there’s a huge difference between hitting one out of three shots and making two out of three. That targeting computer is enough to keep the game from bogging down.) Also, I did have to explain them when my son questioned a ruling that seemed unfair to him… but once I went over how it worked, he was satisfied. The ramming rules did not bring the game to a halt, but ended up adding a lot of color and excitement. I noticed that there was no “confetti rule” in this edition, fretted over its omission, and then realized that it wouldn’t really add much in the one situation where it could have applied. The Shogun 200 could have taken at most 20 points of damage under that rule. The back armor, the power plant, and the cyclist could altogether take less hits than that. At the same time, (and as I said before) I probably botched the ruling with how much damage my son should have taken in the head on collision he executed. Most of my games have been with cars that are more or less in the same “weight class,” so I haven’t had to deal with this often. 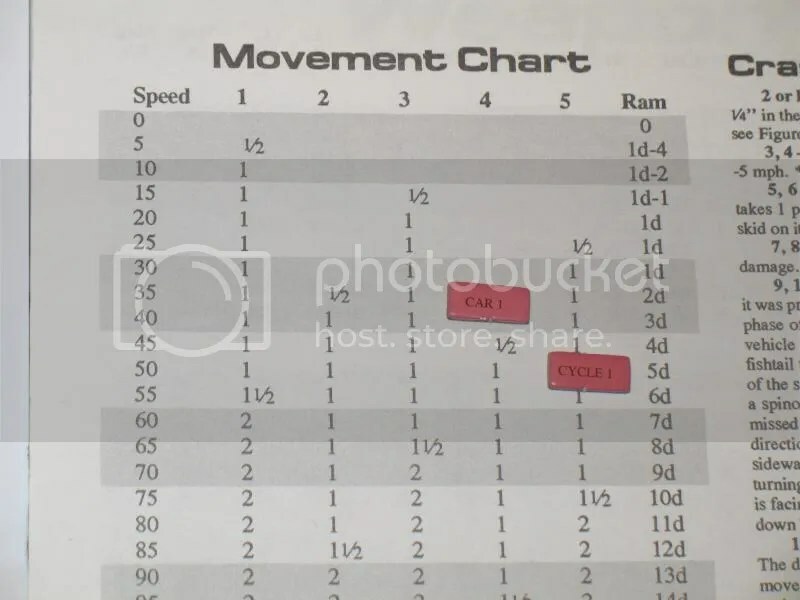 I will say that in the heat of the game, it was not entirely clear how the fraction from the Temporary Speed Table interacted with the speed losses called for by the collision rules. I just picked something that made sense and kept moving. One other thing I used to fret over was how to apply the to-hit penalties for hazards taken. I used to want to apply hazards received due to weapons fire to shots made on the following phase, but it was a bear to keep up with it. Applying penalties just for maneuvers made and debris hit in the current phase is plenty of color and is sufficient to get the basic intent of the rule into play. I don’t know why I was so hung up on that before. Counter fudging and the dreaded “sneeze of doom” are well known issues with Car Wars play– and they’re made worse when your map doesn’t yet lie completely flat. (I tape mine down rather than using Plexiglas or something. 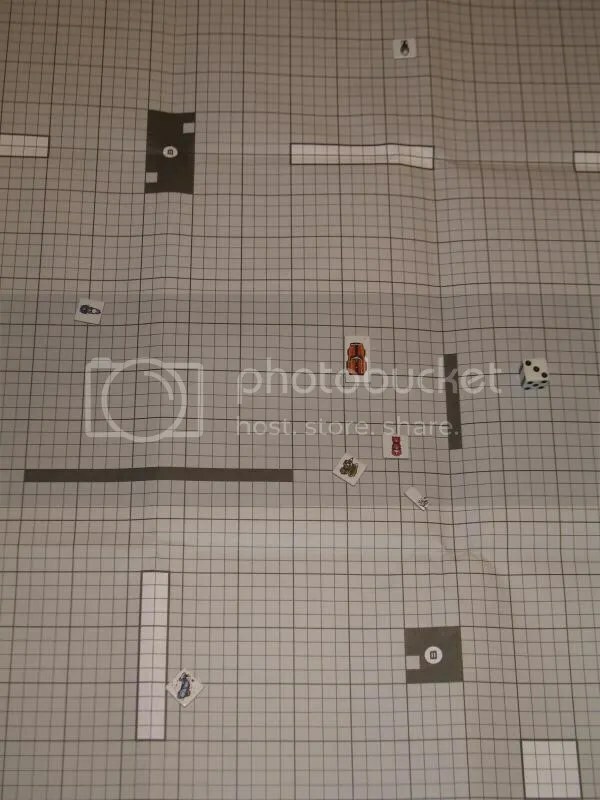 Other people actually iron their arena maps.) My opinion here is that there was really nothing that happened in this game were a quarter inch of movement or fifteen degrees of positioning could have really impacted the situation all that much. Yeah, I’d like to have a table sized tablet to keep up with everything perfectly, but I was not feeling the OCD on this point. Okay, now that really is just about everything. I’ve confirmed that I’m fairly happy with the rules even if I flub things occasionally. Hopefully I’ve illustrated a little of what can be done if you choose to focus the time you’d spend on designing vehicles on the other stuff that’s in the game: the driving tactics and the continuing characters. 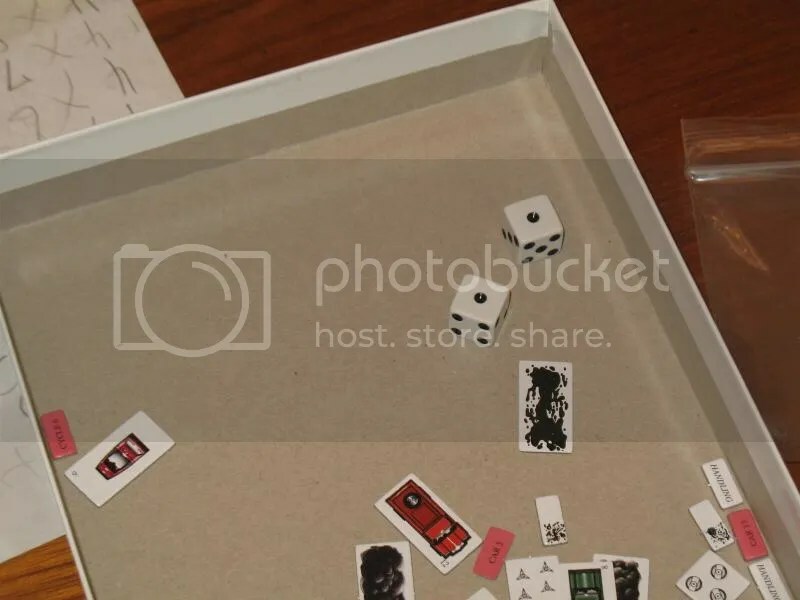 Even as simple as this was, this session has moved this classic game to the top of my son’s “want to play” list. And yeah I do occasionally realize that he is about as old as I was when I first picked up my black pocket box edition of this. We’ve got some great game sessions to look forward to thanks to this set…! that reeks of lack of play-testing, which is very out of character for SJG. Perhaps they figured, “it’s a reprint, we can do without”? I have no idea what happened with the counter sheet, but… yeah, doesn’t look like anything like blind testing was done. The cars are numbered for use with the pink movement chart markers. The cycles must have come from the numberless alternate sheet that had smaller versions of the vehicles for that. You can see on it that none of the vehicles were numbered on that one. Car Wars: Paranoia Edition – The Cycle Counter Counterattack. That’s an interesting/compelling argument for leaving the design rules out of it. Playing this game with six people that know how to customize their own cars is massively fun. But the game holds up without that and continuing characters adds a dimension to the game that doesn’t tend to come up in BattleTech and Star Fleet Battles as much. Dawn Patrol is the first game to really pull that off as far as I know. Six sessions, our mechanic had extremely limited upgrades/mods at his disposal at least half of my missions were on foot. We pretty much played the movie, except when Chuck drove the semi-tanker out, it hadn’t been filled with sand. It was filled with explosives. 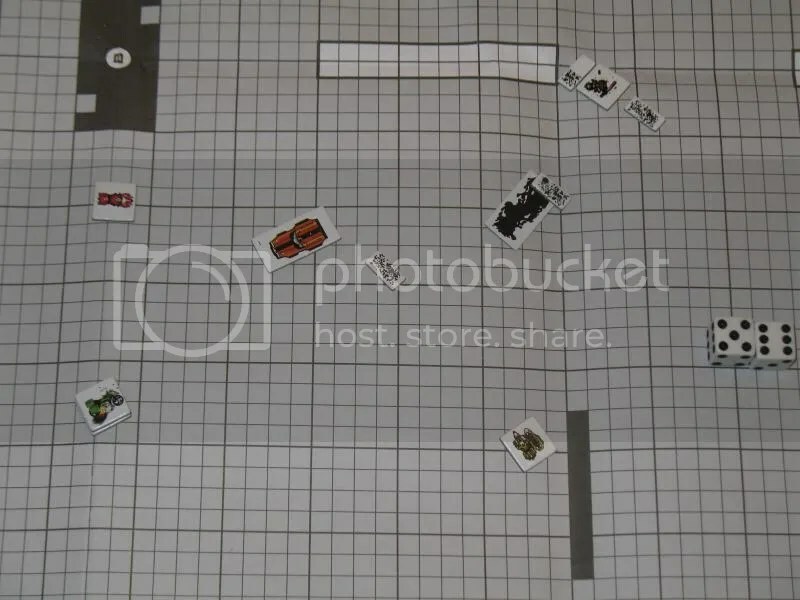 Interestingly, I don’t think I ever played campaigns with matchbox cars. It was counters all the way. Arenas were almost always my variously decayed hot wheels. There is an elaborate gas refinery scenario in ADQ 1/3, but yours sounds totally rad. The only quarterly I ever got was one that was on a floppy disk I got from a friend. I was a farm kid…and apparently didn’t know about these new fangled things called subscriptions. The guy who played Chuck AND supplied the hand-drawn setting and scenario and details might have had ADQs though. No idea. It was rad…especially for a two person, totally self-governed campaign that actually had a reasonable end to it. (Hint: it sounded like Splyohachhhhhhh-bsh-bsh-bhs-bwhahhh! but cooler). The guy playing Chuck must have known every line from the Road Warrior, The Good, the Bad and the Ugly, Silverado and Terminator. He also had a VCR. I think that’s why he got to play Chuck. Feral gunner kid was more fun though. Stole Gigantus’ jockstrap, that sort of stuff. One of the worst blows to my nostalgia was when I visited my high school reunion, and remembered the name of every man’s former RPG character, down to their equipment list and prized possession, and every last one of them – EVERY last one (including “Chuck”) responded with completely blank stares. Sheesh. It wasn’t as if I had asked them to roll up stats or anything.